How many of you have had to wake up to curly frizzy hair? I think it’s safe to say that the curlier your hair, the more prone to frizz that it can be. You know what the absolute worse part is? People telling you to “just brush it out” because that will help tame the curls. Uh…negative. It just makes things worse! So, what is there to do when you need to tame your curly frizzy hair? Keep reading to discover how to deal with frizzy hair. Before we get into ways to treat frizzy hair, it’s a good idea to know why your hair is frizzy in the first place. Contrary to popular belief, it’s not a hereditary thingy. In fact, frizz generally correlates to damage. Now before you say try to argue me down about the health of your tresses, hear me out. One of the major causes of frizz is a lack of moisture. This can mean a heat styling tool that is too hot, not putting enough product in your hair before you walk out the door, and even using the wrong type of shampoo. Now, although your damage can be subtle, damage is damage. If you’re experiencing a lot of frizz even after using some of our suggested products, you definitely want to take a step back and look at your current haircare routine. Are you using a sulfate free shampoo? Do you flat iron your hair too much without using heat protectant? Do you stay in the shower so long that your hair gets stripped of it’s precious natural oils? If so, just a quick change can all but eliminate your frizz problem. Now that we’ve gone through our soap box on how to deal with to frizzy hair, we can start to give you some of our favorite frizz fighting products. The best products for frizzy hair are outlined below. This product is a powerhouse for controlling curly frizzy hair. Not only does it defrizz and keep the hair hydrated, but it also has UV protection for when you go outdoors, allowing you some protection from the sun. Did we mention that it’s also great for all hair types? Bet you didn’t expect to see this on the list, did you? If you’re having trouble with frizz and need something quick, just mix a smidge of this on your hair. Instant de-frizzing at less than half the price. You can’ t beat it with a stick. This one is our favorite! The weightless formula repairs hair without weighing it down making it soft and manageable. A luxurious blend of avocado oil, Goji and Acai berry is part of a perfectly formulated smoothing mask which nourishes, strengthens, and rejuvenates damaged hair! All of these products are also great for human hair wigs too, so feel free to use them as often as you need to. Just remember that the best products for frizzy hair all have some type of moisture. What are some of your favorite ways to combat frizz? Tell us about it in the comments! I love Beauty Marks Products. I had a wig that was really frizzy and I tried a bleach bath that did not work. I used Beauty Marks Synthetic Products it made the wig look brand new again. 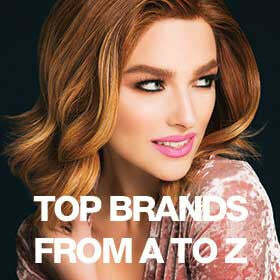 Beautimark makes a line of synthetic hair care products formulated free of toxic parabens. The leave in conditioner and shaping creme help tame any unwanted frizz!